Specifically designed to stabilise gum disease, without a handle (but with a long safety tail) to reduce plastic waste. The VisionPerio Interdental Brush is the first dental cleaning device designed in the UK to specifically target gum disease and prevent the need for gum surgery through its unique shape, variable sizes and ease of use. The brush was created by Maggie Jackson, a nationally acclaimed dental hygienist with an M.Phil. in Periodontology and over thirty years of on the job experience. Maggie has carried out extensive research into gum disease and effective cleaning and treatment techniques, which resulted in the creation of the Vision brushes. The brush are modelled on a curved design in order to effectively compress gum tissue and clean deeper than other brushes and dental floss. By compressing the gum tissue and getting a thoroughly deep clean, you will dramatically reduce the likelihood of surgery being required. The brushes come in a variety of different colours so that patients and dentists can easily identify the different sizes, and adapt the treatment to a specific mouth. The brushes have no handles in order to encourage effective patient use, which involves the feeding of the brush into the space between the teeth bit by bit. 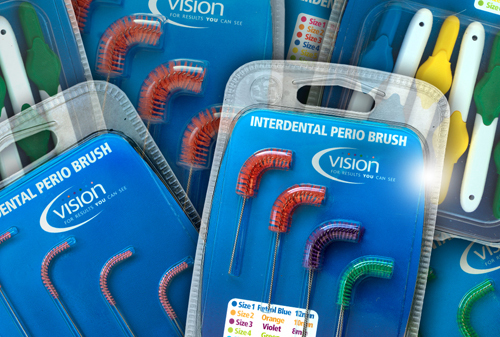 To find out more about the brushes, please browse our website, or contact us here if you think VisionPerio Interdental Brushes are perfect for your dental surgery, or your personal use. To learn about Maggie and how these unique brushes were developed click here. Because many people find using interdental brushes rather than floss more ‘user friendly’ Dental Hygienists and Dentist encourage the brushes for interdental cleaning and Periodontist consensus is that interdental brushes are more effective than using floss where there is bone loss. The VisionPerio Interdental Brush can improve results further, improving interdental health by reducing plaque and bleeding in deeper sites so stabilising bone loss.